Most users often assume that the bandwidth of their Internet connection to decide the overall performance of the connection. However this is not entirely true. There are many factors play a role in determining the overall performance, such as speed servers that users want to connect, network connection type (wireless or wired), router and network bandwidth as well as the delay. And one of the few systems are most concerned that the DNS server (Domain Name System) of the user. When you enter a web address browser, your system will send a request to the server DNS lookup to find the IP address of the server that is hosting the website domain name. The same thing happens when you use Internet applications, email client or other program to access Internet resources. Basically, the Domain Name System is a name resolution system for Internet-connected devices, we will translate the domain name easy to remember the IP address only pure numbers. For example, when you enter www.pcworld.com (or pcworld.com) into the browser, your system will respond with a DNS lookup of its resolution; if the IP address need not be stored in the cache, your system sends a request to another DNS server, this work is done until that server responds with the appropriate address - in this case is 70.42 .185.10. In the meantime, you must wait until the search request and complete - and if the request fails at a certain server, your system must switch to another DNS server request. The DNS servers essentially act as intermediary to link your system with all the resources elsewhere on the Internet. Normally, your ISP will provide DNS server and assign them via DHCP (Dynamic Host Configuration Protocol). When they do a good job, you will not see the phenomenon of delay in the approval process or the use of online resources. Because of this reason that the search for the DNS servers fast processing speed is a very important issue. The DNS server is provided by many ISP by default does not always perform best or most reliable, while many other public DNS options to meet this. Finding the fastest DNS server for a connection that is difficult for most users, so we'll show you how to find the fastest DNS server and zone configuration systems to use them. 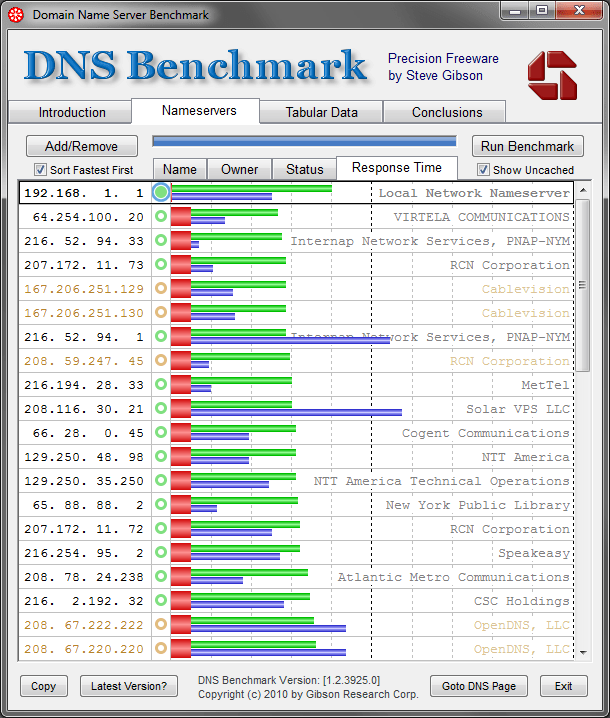 Start by downloading two utilities to determine the fastest DNS server in your area: DNS benchmark utility and open source Namebench GRC's DNS Benchmark. Both have the same functionality and the best way that you should run both to see the results are consistent or not, even though DNS Benchmark utility with more comprehensive options. To run Namebench, just download it and double click the executable file. When Namebench interface appears, analysis of the global DNS option Include Include best available regional providers and DNS services, confirm that your location is set up correctly in the corresponding pull-down menu, click Start Benchmark. Namebench process will run a few tests, then allows you to switch to the results page that lists the fastest DNS server that your system can access. 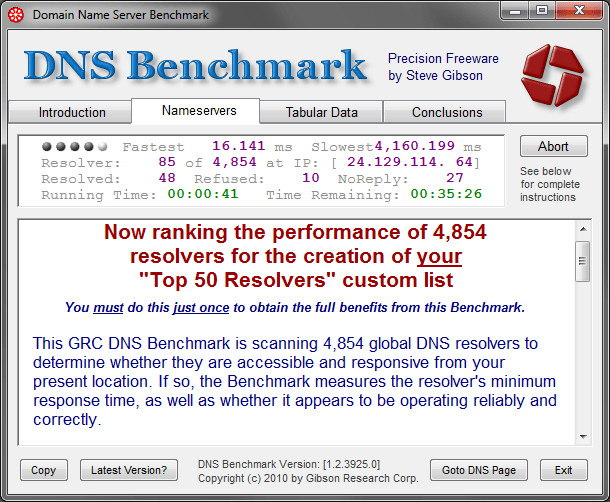 GRC's DNS Benchmark also similar. Download and double click the executable file to run the utility. When DNS Benchmark interface appears, click the Nameservers tab, then the button Add / Remove. DNS Server IPs Edit window opens. Below this window, click the option Build Custom Nameserver List. In the results appear, click on the list, GRC 4854 DNS Benchmark can scan the global DNS resolution to answer the question whether they can access from your location or not. When the list is complete, click the Run button on the tab Nameservers Benchmark. When the benchmark completed its work, the program will display the results automatically, classified according to the response time. In both benchmark, the DNS server with the fastest response time will provide the best performance. Record on the same IP address so you can use them later on in the system configuration. 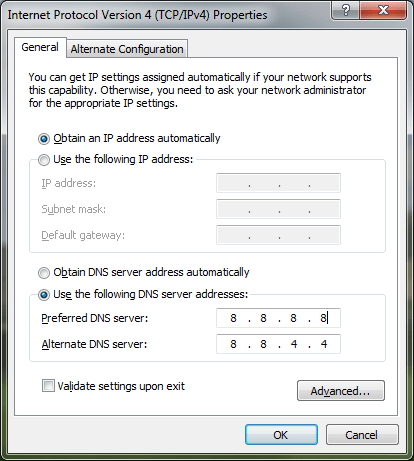 You can set Windows 7 to use the preferred DNS server by changing the appropriate settings in the Network Connections control panel. Click the Start button; in the Search box, type Network Connections and press Enter. Now you will see a list of network adapter installed on your system. The DNS settings must be configured on all network connections active. On a desktop, just the configuration done on an adapter, the notebook but we need to configure both wired and wireless adapter if using both. The network adapter will have a positive network name is listed directly below the name of it and not have the red X icon. Right click on the active adapter, select Properties and click the Networking tab. On the Networking tab, you will see a list of items used by the network connection. In this list, check the Internet Connection Protocol Version 4 (TCP/IPv4) and click Properties. In the window that appears, click the General tab if it is not already selected, integrated radio button labeled Use the Following DNS server addresses. The two schools will become available - one is the Preferred DNS server and Alternate DNS server is. In the Preferred DNS server field, enter the IP address of the fastest DNS server (the benchmark) in the Alternate DNS server field, enter the DNS servers Monday. Click OK in that window and click OK again in the network properties window. Then close the list of network connections and restart the system. Now that you have configured Windows to use the fastest DNS server in your area. For all systems connected to Internet through broadband router using the same DNS server, enter the IP address of the server setting the network address of the router. Configuring Windows as a way to ensure that the system is using the DNS server is the fastest. To arrange for all systems are configured via the broadband connection - regardless of their operating system - use the same DNS servers, you need to change the settings in your router. The setup for the router to use the preferred DNS server is quite different for different routers, but the basic process is relatively the same. The best way is that you should see the user manual of the router, here we offer a few basic steps reference nature. Most routers allow you to set up our system through the web interface. Open a browser and type 192.168.0.1 or 192.168.1.1 in the address bar. There are many IP addresses that most broadband routers today use. If both the above address does not get you into the router's configuration interface, you can find the IP address of the router in its user manual. Choose Control Panel, Network and Sharing Center, Change adapter settings; double network connection active; click Details, and find the IP address listed under 'IPv4 Default Gateway'. Get the IP address and add http:// in front of it, then paste into the address bar of your browser.